Serverless computing is hot, hot, hot! And for good reason - it gives us a way to create focused and stateless microservices that solve exactly one problem without having to create a monolithic application and maintain a server. In other words, they are perfect in a mobile app scenario! Azure's serverless offering is called Azure Functions and one way to invoke them is via HTTP requests. Since these functions will be open to the web at large, we'll eventually have a need to require a calling user be authorized in order to invoke them. And that's what this article is all about ... adding authentication and authorization to Azure Functions via Azure AD B2C. 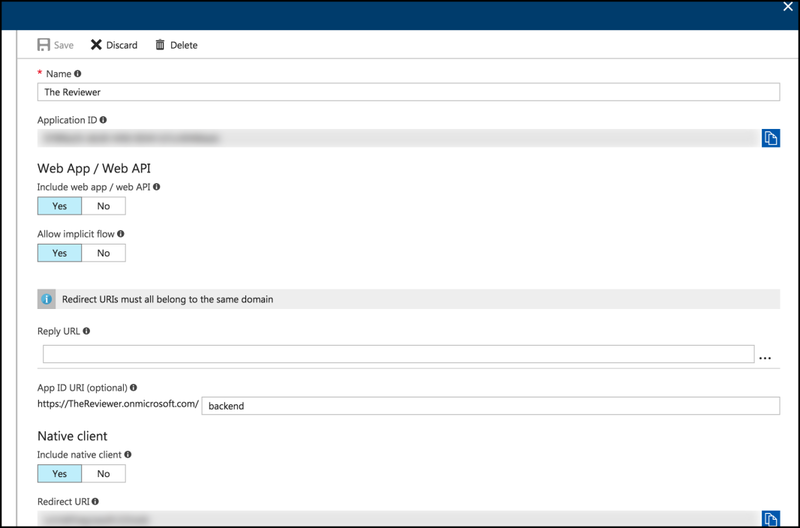 Configuring the Azure AD B2C application within the Tenant to provide authentication and authorization to that function. Then finally some minor changes to our Xamarin.Forms application to invoke the Function which requires authorization. First thing first then - we need a Function! There's going to be 2 parts to creating the Function App ... the first part will be the actual scaffolding of it within the portal, and the second will be the code. Go into the portal, click Create a Resource then find Function Apps and hit new. LOL, right ... that's missing some steps right? The easiest way is to follow the great documentation here. These docs will show you how to create an HTTP Function within the portal - and that's exactly what we want! The function that we'll be working with is simple - it will do the same thing as the ASP.NET Core Web API did - return reviews to be displayed in our Xamarin.Forms mobile app. Don't worry if you don't quite understand all of the specifics - the gist of it is the function is returning a JSON representation of 2 Review objects, one says Good the other Bad. How Do I Invoke This? And click on the </>Get function URL button in the upper left. 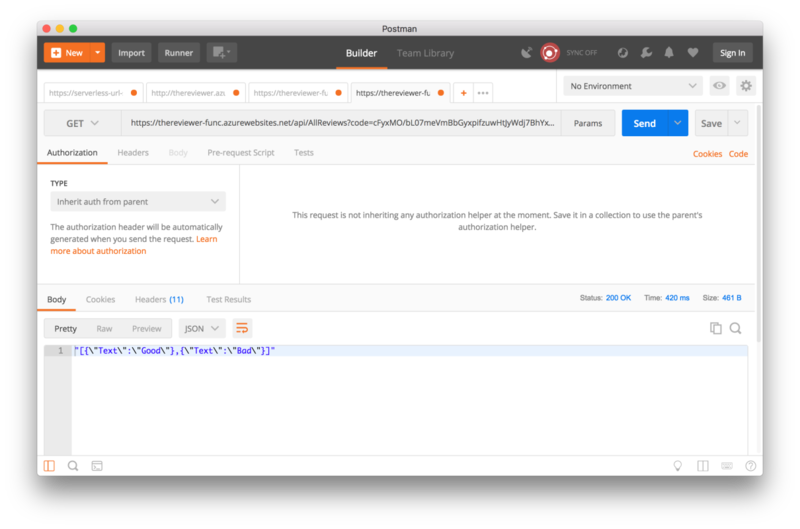 You can then issue a GET request against it in Postman (or a similar utility) to see the return value. But that's wide open to anybody on the Internet to get at - so let's lock it down so only people within our Azure AD B2C Tenant can access it. In the previous post on adding authentication to a Xamarin.Forms app we walked through the steps necessary to create an Azure AD B2C Application within a Tenant. We're going to use that same Azure AD B2C Application here, this time adding in our newly created Function App as another client to it. The first thing to do is get the overall URL for the Function app. That's going to be on the main blade on of the Function app, under - you guessed it - URL. Copy that value and then open up the Azure AD B2C Application (remember, it'll be in a different directory, so you'll need to click on your name in the upper left to get a dropdown to appear). Once the Application is open, toggle the Include Web App / Web API switch to Yes. That will bring up a screen with some blank text boxes (in addition to the ones we already filled out for the native/Xamarin client). Make sure the Allow Implicit Flow is set to Yes. Make sure the URL you enter is HTTPS! 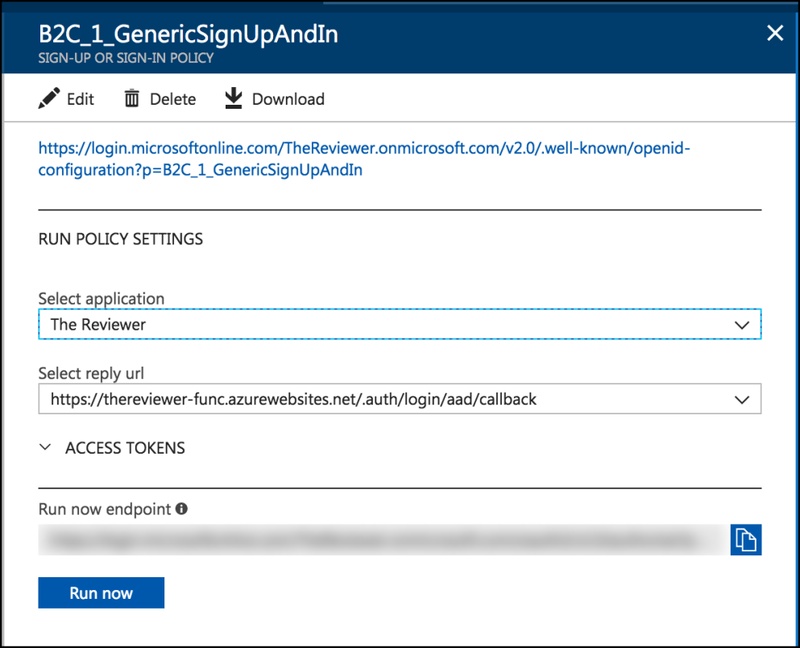 This is letting the Azure AD B2C Application know what URL to send authorization tokens to after authenticating users. That's all there is to enabling the Azure AD B2C Application to communicate with the Azure Function App. The next thing we need to do is setup the Function App to communicate with the Azure AD B2C App. Back in the Azure portal directory that contains the Function App, open up the App you want to add authentication to, and select the Platform features tab from across the top. Then select Authentication and Authorization underneath the Networking heading. Initially it will tell you Anonymous Authentication is enabled - change that by changing the switch under App Service Authentication to On. Then a whole new slew of options will become available. First thing, change the value of the Action to take when the request is not authenticated dropdown to Login with Azure Active Directory. This will then force all unauthenticated requests to follow our Sign-up or sign-in policy that we created back the previous post where we initially added authentication to the Xamarin.Forms app. Next click on Azure Active Directory (Not Configured) button - which will bring up the following screen. Change the Management Mode to Advanced. Two new fields will then appear, Client ID and Issuer Url. The Client ID field is the Azure AD B2C Application's ID (so you need to go back into there and grab that ID from the Application blade). The Issuer Url is obtained via the policy we're invoking during the sign-in process. That's also in the Azure AD B2C Tenant. Select Sign-up or sign-in policies. 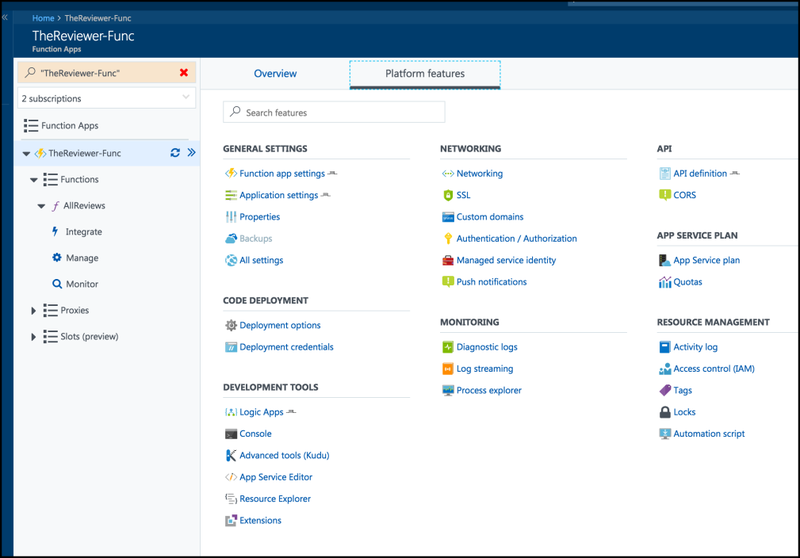 Then select the policy you have tied to the Application's API Access (again from that previous post). There you will see a URL at the top of the blade. Copy that link - it goes into the Issuer Url on the Azure Function side of things. Once you have the Client ID and the Issuer Url filled-in, you can click OK. It should then tell you that Azure Active Directory has been configured. Click Save at the top of that blade, and now the App Function requires authentication before it can be invoked. Try it by issuing the same GET request in Postman. You should receive a 401 error. There are very few changes to our code necessary! Since we're still authenticating to the same Azure AD B2C using MSAL, we do not need to change any of the calls to AcquireTokenSilentAsync or AcquireTokenAsync - those still return exactly what we need - and that's the AccessToken. In fact, the only change to the code is updating the URL of where the HttpClient performs its GET operation against. And with that our app should now be displaying the reviews - but this time obtained via the Azure Function! A lot of portal configuration again in this article! The main key here is that we added a Web App / Web API client to the Azure AD B2C application we previously created to model that the Azure Function will be receiving information from the Azure AD B2C Application as well. The URL entered into the Reply Url field is the Azure Function main URL plus /.auth/login/aad/callback signifying where the Azure AD B2C application should send its info. 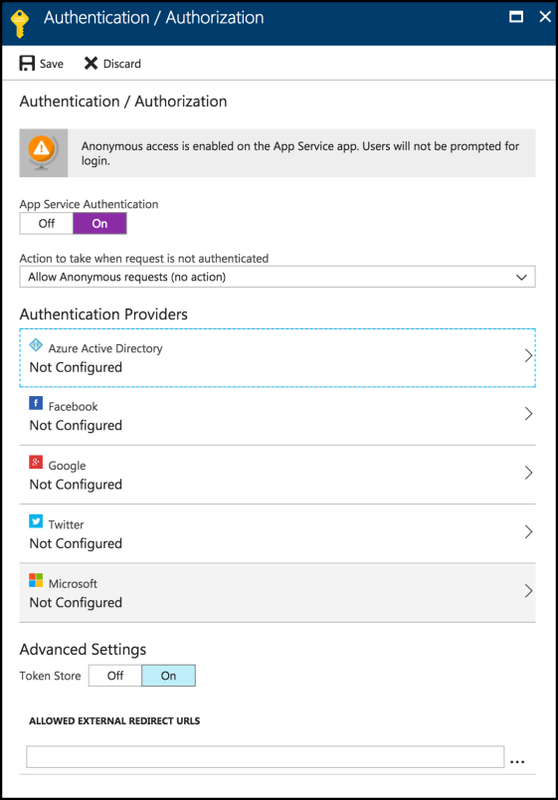 The Azure Function App can be configured to use B2C by turning off anonymous authentication and then entering the Azure AD B2C Application ID and the sign-in and sign-up policy URL into its configuration. And then the Xamarin.Forms app needs the least amount of changing! All we need to do there is change the URL it's pointing at, and everything will just work!